It is not easy creating the home of your dreams in 2018. With decreasing square feet, Instagram trends that change at the drop of a hashtag and, of course, inspiration all around ­— it is a decidedly delicate situation. There’s a reason we’re emotional about the term ‘millennial home’. Let’s travel back a few years — to before 2010 when there were two kinds of homes, broadly speaking. The first spoke eloquently of culture and expensive art. And then, there were the offbeat, bohemian and a-tad-too-kitschy homes, a hangover of the early 2000s. And this leads us to ask if there is another sort for millennials who are looking for more than just these two kinds of interiors for their homes! These could be some sort of hipster-meets-happy-spaces that are all about comfort, minimalism and yet are timeless and trendy as the most contemporary ideas all melded into one giant cup of informal-casual goodness. 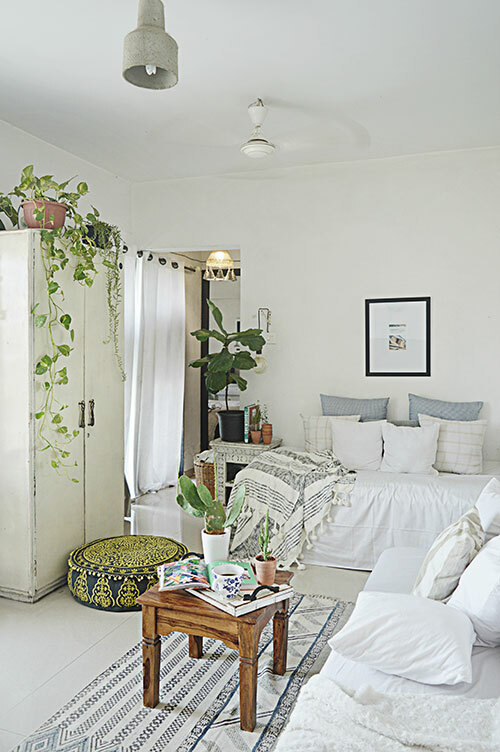 And informal is the word that blogger Rukmini Ray Kadam uses to describe her home that is her muse for her décor blog, TruMatter. This is a breezy, urban space that showcases decor styles in the most unique ways possible. The drama that unfolds on the TruMatter Instagram page is well worth our time. Each picture that Kadam uses as a vignette provides a mini window into her world that is filled with versatile ideas for the millennial. Kadam’s apartment is only 570 square feet, overlooking greenery and the action in Navi Mumbai. She’s living proof that you can create wonders in smaller spaces by increasing the cool factor in newer ways. Kadam, a social media manager at a food tech company, is also a full-time blogger and photographer. 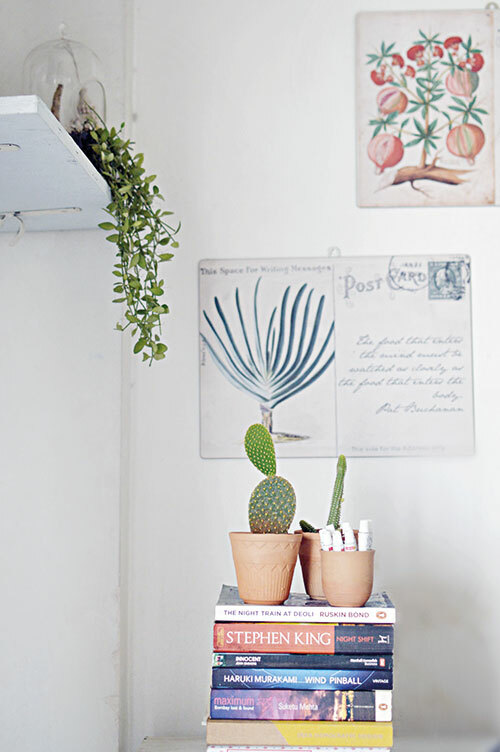 Her flat is a rented space and that changes the equations of decor dynamics ­— because moving around things and making a home that suits your needs and wants is lots of work in a space that you do not own. But she is not one to shy away from a challenge. She proves her talent by working around the limitations that her home offers and recreating it into a modern livable space. “Comfort, informality and a place that’s your own paradise ­— my home is inspired by the palettes of the beach and the minimalism of the Scandinavians,” says Kadam, whose decor signature comes from a laid-back attitude coupled with a generous love for the offbeat. Kadam explains, “I wanted a home that’ll take me away from the hustle and bustle of everyday warfare and put me in a spot that makes me feel like putting my feet up, drinking tea and dreaming of the sea. A space that’s soothing to the eye, which lets you catch up with your dreams, encourages pyjama culture and becomes the sweet refuge that you so seek when you are home after a long, long day.” And with most millennials living hectic online and offline lives, that is what they tend to seek. For optimum use of space and to create the right impact, the trick that Kadam swears by is to restrict the use of colour in a country that favours the big and the bold. “Honestly, everything is so vibrant and colourful here in India that at times it can get really overwhelming. You’d want a break from ‘so much’ and yearn to feast your eyes on ‘less’,” adds Kadam, whose sensibilities are all about less is more. She is inspired by Rachel Ashwell’s shabby home, Dreamy Whites Lifestyle’s beautiful French-inspired home, Justina Blakeney’s stunning Jungalow by the River and Whitney Leigh Morris’ tiny canal cottage ­— all dream abodes that have massive fan followings on Instagram. But the main inspiration for this Navi Mumbai residence comes from nature. And little knick-knacks create their own magic in the space. 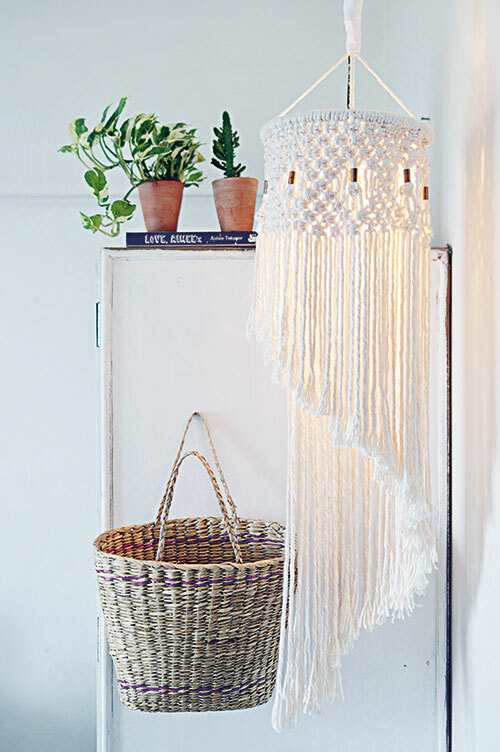 “My favourites would be a shell that my husband picked up for me from Cambodia, a starfish that a friend found on a dive, and straw beach bags I picked up from Sri Lanka. And not just on my travels, it’s also local decor items that are common and easy to procure like the cute terracotta pots that I picked up from a local nursery in Mumbai and the oil measures I got in from a ration shop while on a run,” adds Kadam. What really makes her home charmingly millennial? 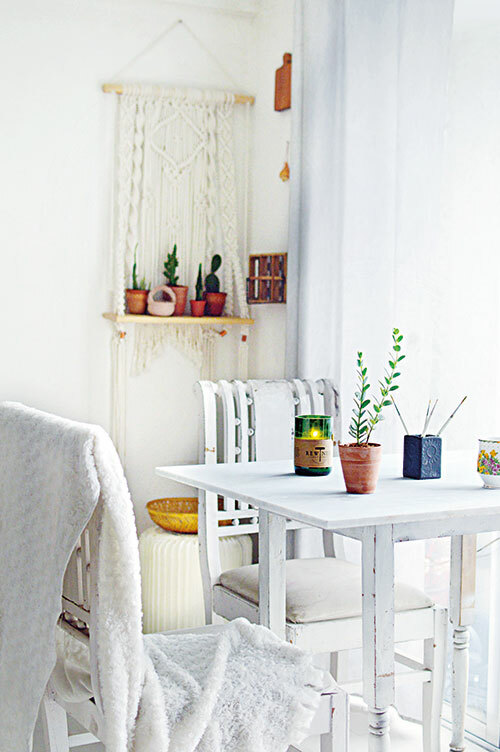 Trending ideas that almost make it into the home are hygge and other Scandinavian delights. “We are getting away from the rustic baby-boomer hangover and switching it up with a lot more warmth, mood and vibe, all the way keeping it light, functional and stylish,” says Kadam. 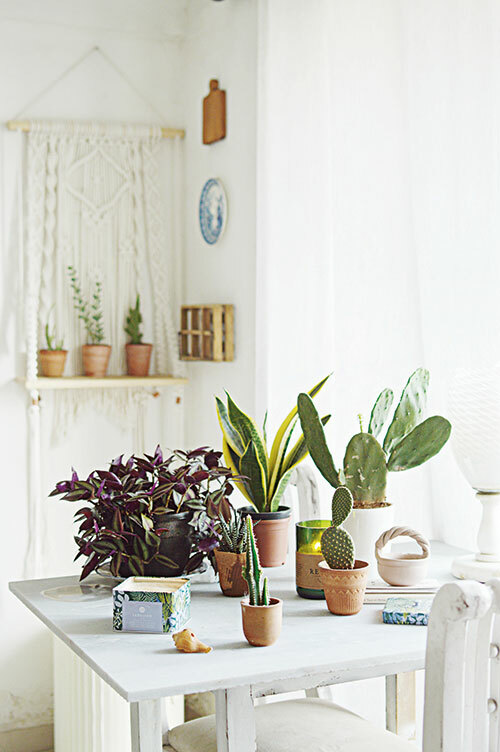 But mostly, the home is done up keeping five things in mind ­— a distinct personal style, functional but space-saving decor pieces that double as storage, a surprisingly attractive neutral palette, and a plethora of plants (even time-consuming ones like succulents, cacti and the money plant). “Maintaining a balance between designer pieces and local vintage finds or street-side stores to find one’s personal style is the most millennial thing ever, and that’s what you’ll find in my house. My grandma did it first though ­— but now we have a term for it!” says Kadam. Her home also emphasises comfort, and her decor pieces are specially chosen to instill that sense of homely familiarity, a soothing “lived-in” vibe. “Lots of throws, rugs, and cushions rule my home’s roost and we love how they are 100 per cent functional and good-looking,” says Kadam. But the real winner is the storage space ­— a bed that doubles up as a storage box, and a shoe shelf that can also be a divan. In 2018, versatility is the name of the game, along with a great, unquenchable love for neutrals and whites ­— a palette that looks dreamy but requires oodles of day-to-day maintenance. “Sometimes, I add a pop of colour here and there to celebrate the season. But most times my home is white with touches of black, pale greys, tan, putty, and very pale blues. All the freshness I need in my home comes from the shades of my plants which set off the neutrals beautifully,” adds Kadam. 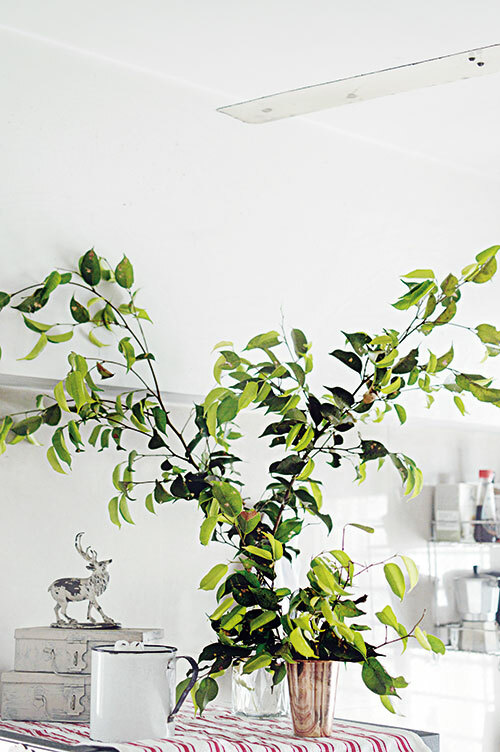 You’ll find lots of plants almost everywhere, which exude a warm appeal. “We have a balcony that has a huge hammock that overlooks the city. On Sundays, you’ll find me either in there or in my tub with a few YouTube series of cooking shows for company,” she remarks with a smile. With recommendations from the internet, Kadam enhances the value of each item in her home. Her goal is to have global designs that work with multiple budgets. “For lighting, I blindly trust The Purple Turtles. For china, The Decor Kart and Ikka Dukka alongside Home Artisan, who know how to balance Indianness with global style. For furnishings ­— it’s The Nascent, The Weavers, and Acasa Bedding ­— fairly new spaces that come with a massive Scandinavian vibe. 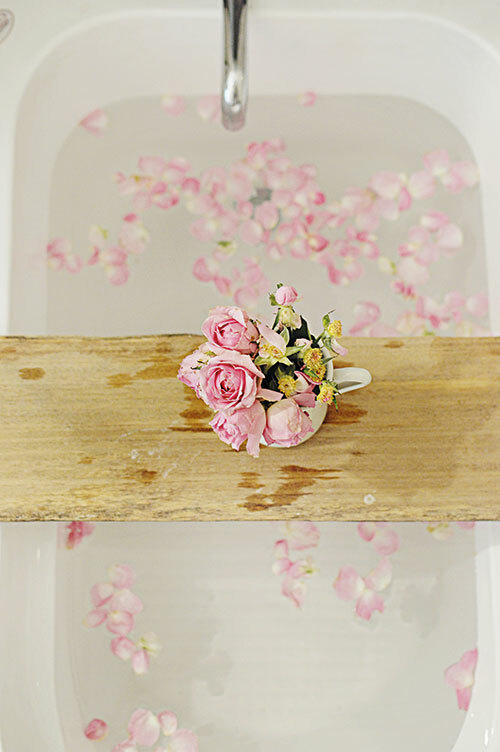 The art of mixing and matching one’s own style with a few pieces that are trendy keep her home and blog stylish. “You’ll find a concrete pendant in our living room and a huge Edison light in one of our corners ­— both of which are in now. There are minimalistic flat weave rugs, pom throws, and even a fiddle-leaf fig tree — and we also have a great tech range that blends beautifully to make ours a modern home,” shares Kadam. The unique features in her home are the ones that can make anyone squeal with delight ­— like the simple bathroom that features a tub, a pendant light, hanging planters, and a trendy study space in a small bedroom. Her coup, though, she feels, is turning her balcony into a quaint little reading nook with a full-sized hammock complete with cushions, fairy lights, tassels and creepers.